A light massage with the gentle, non-oily GEHWOL Leg Balm pleasantly refreshes and strengthens foot and leg skin. Allantoin (found in horse chestnut), bisabolol, hamamelis extract, menthol and panthenol revive and soothe dry skin. Proven active ingredients kill odour causing bacteria and contribute to a long-lasting feeling of freshness. Daily use of the Leg Balm results in beautiful, smooth and supple skin. 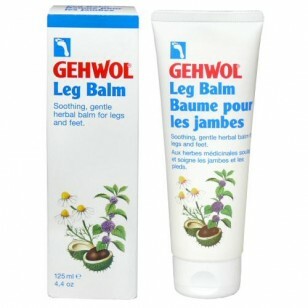 Gehwol Leg Balm also helps prevent leg ailments during pregnancy.